A tidy subtle look of an interior whilst you enter the house automatically catches our eyes without any effort. A cool interior outlook not only creates a good vibe to the surrounding but also makes very appealing for staying, and thus comes the saying; “home is where our heart is”. Talking about house comes one of the important parts-windows that play a vital role in aerial balance of the house and also light from the nature. But it seen and almost faced by everyone that too much sunlight often damages the inner materials of the architecture. Besides talking about privacy you just cannot leave your windows wide open all the time. Here comes the question of guarding your windows and if curtains have bored you or if you are thinking of remodeling your living areas then Roller Blinds are a great option. What are Roller Blinds? Roller blinds are a rectangular huge piece of fabric material that are attached to a metal tube or wooden dowel and are secured between two brackets. They can be rolled up and down without any slats. The spring mechanism or a chain pulley technique helps the fabric in rolling up and down. If you are looking for a modern outlook of your house then you must go for roller blinds. They not only enhance the look of your interior decoration, but also take care of your privacy well enough. There are various other blinds available in the market but roller blinds have few advantages over them. Other blinds seem to minimize the daylight but a roller blind does just the opposite. Roller blind rolls up so very neat that they hardly cover up any part of the window. Follow below to get some useful tips to give a retouch to your house decorations by using simple roller blinds and create a sleek tidy look. No Compromise with Daylights whilst Thinking of Privacy: There has always been a contradiction when it comes to covering your window for privacy purpose that blocks the daylight from coming in. 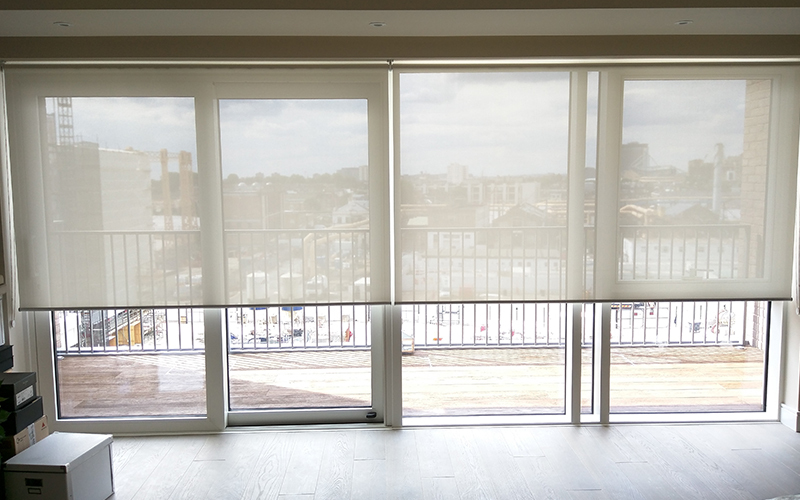 Choosing roller blinds can simply solve your problem. The sheer material of roller blinds blocks prying eyes from entering your living area without blocking the gorgeous sunlight. Protect your Room from UV Rays without Blocking Lights: The living area or the bedroom in the morning just looks fabulous when the sunlight pours in. But have you thought of UV rays that can affect badly in many ways? Well now there are “solar roller blinds” out in the market. They protect your house from UV rays. They are designed in a way that protects the house from UV rays while light penetrates through the blinds. Just let he blinds hang on the window, the light coloured material doesn’t block the light, and the material behind it blocks the UV ray from entering. Now you can enjoy a healthy living. Top Up your Venetian Blinds with Roller Blinds for Full Privacy at Night: No doubt Venetian blinds gives a good protection with its unique designed layering style but construction wise they are bit light. So, if you seek a strong privacy then just add roller blinds on top of your venetian blinds. Roller blinds sit well on top of venetian blinds and thus end up giving you a strong foundation of that extra privacy during night time. Cover your Bathroom Windows with “Water Resistant” Roller Blinds: Of course you wouldn’t want your neighbours to peek through your window even by mistake. Cover it up with “water resistant roller blinds” made of hazy fabric. This will block any view coming from outside yet your bathroom will not run out of light during day time. Creative Temporary Partition with Roller Blinds in the Extended Area: If you have a huge open space then make use of it by partitioning it roller blinds. For example if you have a open kitchen, dining, and living space and feels that concrete partitioning will make it look smaller then create a barrier with roller blinds and partition your kitchen space from your living space. Roller Blinds do not take much space and they look simply cool leaving a nice creative look to the interior yet spacious. Replace Window Curtains with Roller Blinds for More Defined Aesthetic Look: Remove the old curtains that make your room or living area look smaller. Place roller blinds matching with your inner walls colour as they come in various fabrics. They not only create a widened vision to the interior but also define the look of the house and add value to the look of your windows. They also block the extreme heat of the light that prevents dullness of the materials of your furniture. These are the few tips that can follow to recreate the look of your house. They are easy to clean and needs cleaning once in a year. Curtains on the other hand need cleaning often as they consume more dirt and dust. They need a mild cleaning depending on your usage. Just remove them from brackets when you clean them. There are various kinds of fabrics for roller blinds thus they can easily match the inner colour texture of your house. Coming to price roller blinds are much cost effective if compared to curtains. They are available in various shapes and sizes from readymade to custom installed. Thus prices vary depending on your need. They are indeed a great option to go for your house remodeling.